A highly energy-efficient, lower-cost heat source that uses genuinely renewable natural fuel, the trusty wood-burning stove is steadily gaining in popularity once more. These top-quality, elegant new cast-iron and steel models are made exclusively for us at the UK’s oldest stove foundry. Free-standing or inset, matt black or sleek gunmetal, multi-fuel or gas, they’re designed to function beautifully in any setting and can be set off to stunning effect by one of our surrounds. Most are approved by Defra for use in Smoke Control Areas, so whether you’re a rural or urban type we’ve got the perfect stove for you. Acquisitions have used sophisticated styling and proportions to create the Bloomsbury, a modern classic, precision-engineered in high-grade steel and cast iron and available in black and gun-metal grey. 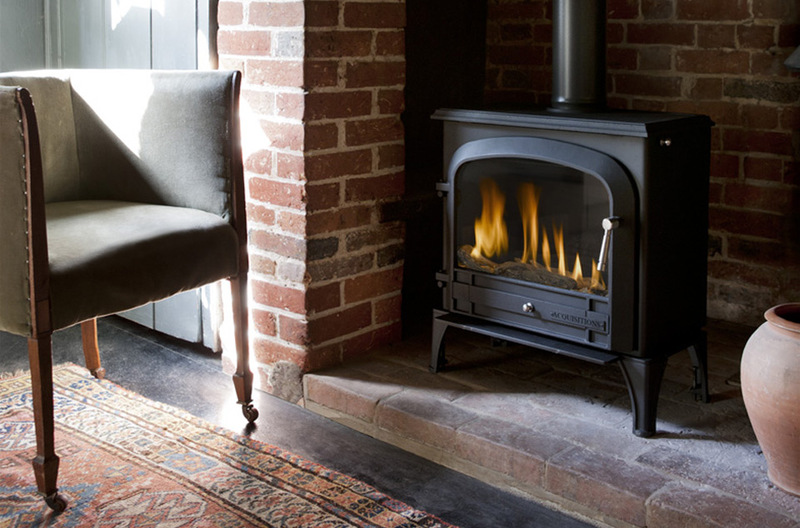 Pictured free-standing but equally at home paired with a beautiful surround, the Bloomsbury is approved to burn both logs and smokeless fuels – even in town. The stove boasts a slim profile that’s suitable even for shallower hearths, an extra-wide window for a generous flame picture, and the ingenious Afterburn™ self-cleaning system. A gas remote-controlled version is also available, giving out 5kW of heat and efficiencies of up to 75%. The Cannonbury Compact freestanding multi-fuel stove is ideal for smaller rooms or for creating an inviting focal point in a modern, open-plan living space. Like the inset model, the Cannonbury Compact can even be left burning overnight. 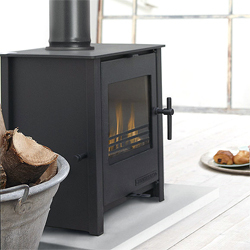 With precision-engineered air controls, sturdy legs, a steel top and Georgian fret detailing – inspired by the Somerset hob grate – this clean, contemporary design can be used free-standing on a suitable hearth, as shown, or housed in a purpose-built cavity or fireplace. The Afterburn™ airwash system also keeps it remarkably clean on the inside. This economical multi-fuel inset stove – approved for use in urban areas – improves on the efficiency of an open fire by up to 400%. Available in two depths to suit the room size and required heat level, it comprises a firebox inside an outer casing, with a cavity between the two. Cool air drawn in at the base is heated and rises out of the top to evenly heat every corner of the room; this process also reduces the temperature of the stove's surface. Each stove bears the Acquisitions hallmark on a discreet, toning steel plate – a daily reminder, should you purchase one, of the quality in which you've invested.